November 26, 2018--I hit a needlepoint slump over the last few months. Just couldn't seem to get into anything I have to stitch--wasn't even interested in starting new projects. What's a person to do? Well, Gary Parr and Christine Williams of the podcast Fiber Talk suggested doing something totally different to get re-invigorated, so to speak. So I chose to learn Portuguese Knitting and made a few small wearables using this new technique. I found a number of YouTube videos on the subject, but the best so far is by Andrea Wong. Her videos, however, are only available on Blueprint (a spin off of Craftsy), but so worth the subscription fee (note--you may find some on YouTube). I have learned so many techniques to enhance Portuguese Knitting and still refer to her instructions every now and then. 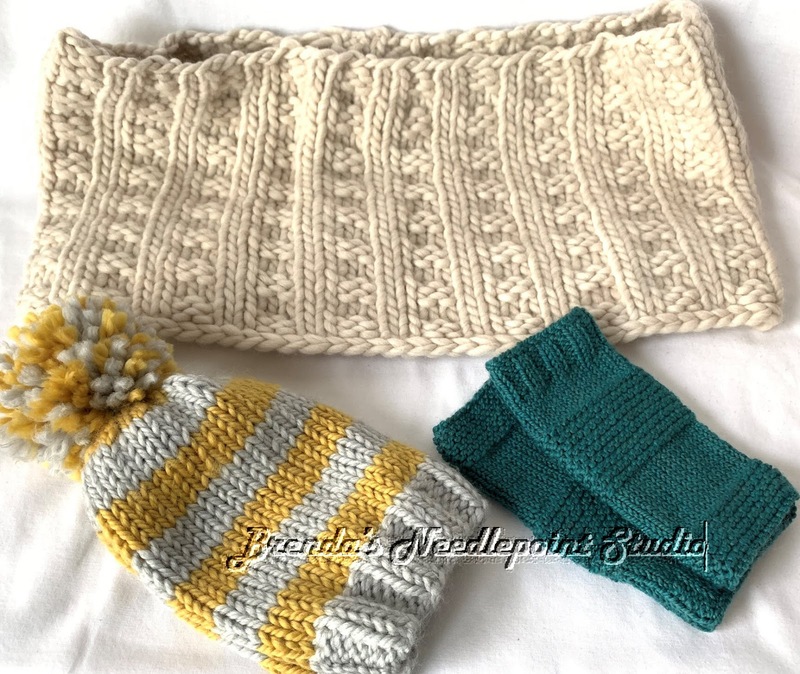 As part of my Blueprint subscription, I received yarn, needles and instructions to knit the three items, pictured below, at no cost: a cowl, hat with pom pom and fingerless gloves. Knitting these items has served the purpose--I'm now needlepointing on an old class project and starting an older Janet Zickler Casey santa. The break was good. BTW, I love to do Portuguese Knitting while traveling in the car. The thing I most appreciate is how the yarn is held in the right hand for tension. My hands have a bit of arthritis and I wasn't able to maintain good tension using the Continental style of knitting. One thing I do differently is how I manage the thread from the front. 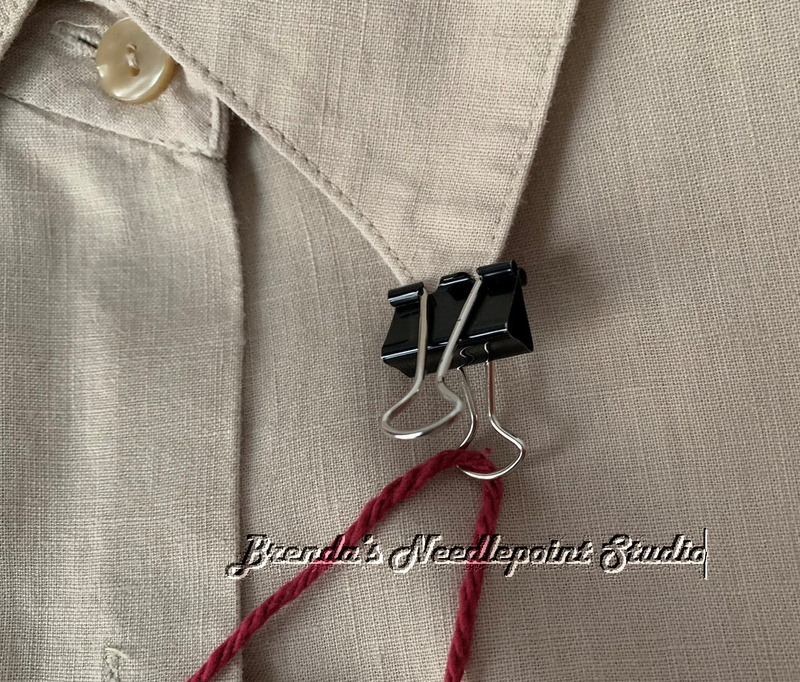 Instead of using a pin attached to the front left of clothing (which can put a hole in your blouse, etc.) or wrapping the yarn around my neck (which I find irritating), I use a small metal binder clip. The silver prongs can be removed from the gray metal clip so that yarn can run through it (see photo below). My community has a knitting club which meets on Friday mornings and they are working on so many beautiful things. Now I'm getting excited about knitting shawls, ponchos, baby blankets, etc. A nice change from dish or wash cloths. Again--I knit in the car only--don't have to worry about dropping threaders, needles, thread, etc.